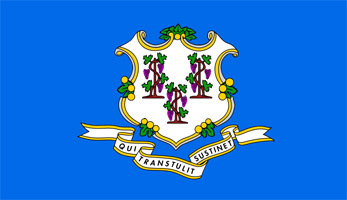 Connecticut, the 48th largest state in terms of area, is located in the northeastern United States. Its borders are Massachusetts in the north, Rhode Island in the east, and New York in the west and south. Nicknamed The Constitution State, it is also the 4th most densely populated state. Other state nicknames are The Nutmeg State and The Provisions State. The state is blessed with rivers, lakes, waterfalls, beaches, mountains, and farms. It has both rural and urban/industrial areas. Along with these natural resources, the state has a healthy and prosperous economy with strong agriculture, manufacturing, industrial, real estate, tourism, and financial sectors. The state is home to the following inventions: the cotton gin, the Colt .45 revolver, the can opener, the portable typewriter, the submarine, the nuclear submarine, the Frisbee, ice making machine, pay phone, collapsible toothpaste tube, vacuum cleaner, Polaroid camera, and vulcanized rubber. Sports fans also have Connecticut to thank for being the birthplace of sports on cable television all day. ESPN was founded here originally broadcasting UConn Huskies basketball, then college basketball and later on expanding to all professional sports. Connecticut also has the distinction of being first in the following: the first dictionary, first insurance company, first public art museum, first use of anesthesia, and the first FM station. Popular tourist attractions in Connecticut are Mystic Seaport, Mystic Marine life Aquarium, Nautilus Memorial, Gillette Castle, Valley Railroad, New-Gate Prison, Branford Trolley Museum, Connecticut river cruise ships, and the homes of Harriet Beecher and Mark Twain.